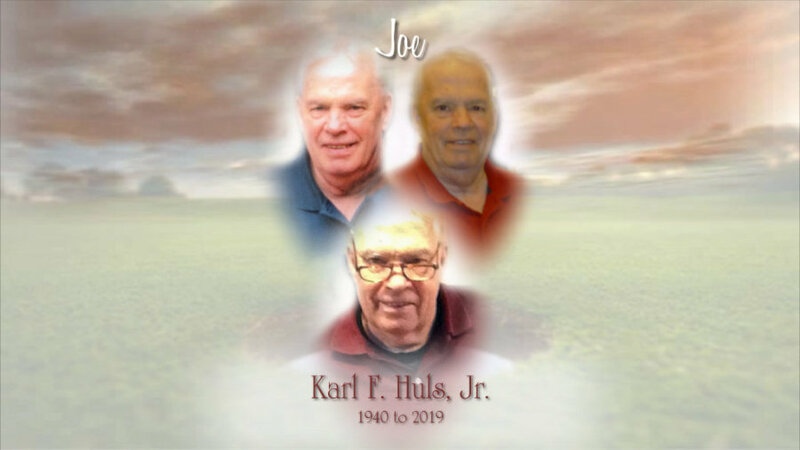 Karl F. “Joe” Huls, Jr. 79, of Ottawa Hills, Ohio passed away on Tuesday, February 5, 2019, at Hospice of Northwest Ohio with his loving wife at his side. He was born January 24, 1940 in Toledo, OH to Karl Sr. and Jennie (Mulligan). He married Dorothy “Dottie” Ruesink on October 10, 1999. Karl graduated from DeVilbiss High School and played on their golf team scoring a hole in one at a Central League golf match and brought home the championship to DeVilbiss. He went on to play on The Ohio University’s golf team and graduated with a Bachelor of Education Degree. He was very proud of beating Jack Nicklaus in the Ohio Intercollegiate Championship Golf Tournament during his college years in 1962. Karl taught physical education at Maple Elementary School and Arbor Hills Junior High School in the Sylvania School District for 35 years. He coached the Arbor Hills girls’ basketball team for 12 years with a final record of 147 wins and 36 losses and two undefeated seasons, the boys’ basketball team winning the NLL tournament and their 7th and 8th grade volleyball teams, that both went undefeated in 1985. He also coached their golf team. While teaching at Arbor Hill’s, Karl had his students “run around the world” to get them interested in fitness. In his later years, he enjoyed playing softball for New York Life and the Toledo Senior Softball League. During these years, he participated in the Ohio Senior Olympic Softball Team. He accomplished riding across America in 1976 on his 10 speed Fuji Bike. Karl was Dottie’s soul mate and the love of her life. He loved being with her, his “bonus” daughters and had a special connection with his grandkids. He enjoyed telling stories and would often embellish the story line, with his wife joking about his “Pinocchio” nose. He was a member of the Elks Lodge #53. Karl is survived by his loving wife, Dottie; bonus-daughters, Dori (Tom) Durbin and Paulette “Pet” (Kyle) Folger; grandchildren; Isaac and Olivia Durbin, Karly, Khloe and Kyla Folger; his special pal, Bentley, who loved to sit in his lap and watch TV; nieces, Judy Wenderoth and Peggy (Harry) Gaurilloff and great-nieces and nephews, Daniel and Philip Wenderoth and Karen Grace Gaurilloff. He was preceded in death by his parents; sister, Jennie Lou Hunt and nephew, Steven Hunt. Visitation will be at Reeb Funeral Home, 5712 Main St., Sylvania, OH on Friday, February 8, 2019 from 4pm until 8pm, where the funeral will be held Saturday February 9, 2019 at 10am. Interment will follow at Ottawa Hills Memorial Park. Those wishing to offer memorials are asked to consider The Victory Center.